If you love what you do, it’s not really work. 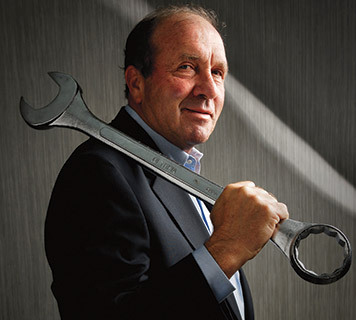 Since founder Don Kotula opened his garage door to the world in 1980, Northern Tool + Equipment has stayed true to a vision that has guided the company ever since — building lasting relationships by providing the right solution for our customers. Today, Northern Tool + Equipment has grown into a billion-dollar company that provides over 40,000 carefully chosen tools via catalogs, website and retail stores. We seek talented people who wish to share their initiative, ideas and expertise; we develop and support our teams and we put them in a position to succeed. We know our customer, we provide value and we act with integrity. We are True Northern. Can a family business be a major player? Taken together, Northern Tool + Equipment’s operations generate over $1 billion in sales each year. Within our industry, Northern is a recognized leader. At the same time, Northern Tool + Equipment is a family business in the ways that matter. Senior management is just down the hall or up the stairs from everyone in our headquarters building. Don Kotula isn’t an oil painting in the lobby — he’s walking the hallways and offering ideas (and wisdom) to the team. At Northern Tool, we’re far more interested in building relationships than we are with simply making transactions. Our customer base is exceptionally loyal, because customers know that we will give them the right solution. Our employees are loyal, too – because we strive for low employee turnover, we regularly celebrate work anniversaries at Northern. Every year, team members earn recognition for 5, 10, 15, 20, 25, even 30 years of service. From the beginning, Northern Tool + Equipment has been on a continuous pattern of growth. By staying true to our Core Values, Northern has been able to maintain success in its operations and thrive in good times and periods of uncertainty. Northern is an industry leader. We listen to the customer and respond. We offer top-quality tools and expert advice to our customers. We have a manufacturing facility where we design, test and build world-class tools. Our merchants travel the world to find superior products. As a family-owned business, we don't just talk about work/life balance at Northern Tool + Equipment. We have respect for personal lives; wherever possible, we strive for flexibility in work schedules and we maintain a relaxed, professional atmosphere. By treating our employees with respect and understanding, we are able to maintain a cohesive team. I think a lot of companies ignore the discussion of values in the work place. Northern not only embraces values, but clearly defines them and provides a process for recognizing them in our employees every day. Many core activities take place at our corporate headquarters in Burnsville, Minnesota. Among the departments located here are: Advertising, Real Estate/Facilities, Accounting/Finance, IT, Marketing, Operations, Business Development/Compliance, Merchandising, Retail, and Human Resources/Learning + Development. Team members at WHQ hold positions from entry level through senior management. While Northern Tool + Equipment began as a nationwide mail order business, our retail stores are an integral part of our business. We operate stores in multiple states and we are expanding into new markets at a steady rate. We have a particularly strong presence in the Southeast, the Midwest and Texas. We offer part time and full time positions in sales, product placement and cashiers. Management level opportunities include Assistant Store Manager and Store Manager positions. Our state-of-the-art facility in Faribault, MN is a key part of our success. We design, build and ship NorthStar and Powerhorse products, including high-quality generators, pressure washers, water pumps, air compressors, log splitters and more. By building these items ourselves, we provide our customers with premium tools at direct-from-the-manufacturer prices. We have opportunities in assembly, machine operating and welding, along with positions in engineering, customer care, purchasing and more. Customer Service and Sales Departments are housed at WHQ; additional customer service and sales takes place in Pequot Lakes, Minnesota. Available opportunities include careers in both inbound and outbound sales, customer care representatives, operations, as well as management positions. Since we are a company founded and built on providing solutions, we as employees have the platform to contribute ideas at any level of the company. It’s easier to have your voice heard. It’s great to be part of a culture that provides such a platform. Our distribution centers support our businesses. Our largest facility is in Fort Mill, SC (near Charlotte). We opened a new distribution center in Arlington, TX in 2011 that is key to supporting our retail growth. We have career opportunities for fork lift drivers, receivers, pickers and supervisory personnel. Northern Tool & Equipment retail stores offer complete parts & repair services for outdoor power equipment. Our shop-within-a-store concept is staffed with factory-trained and certified technicians working on residential and commercial mowers, trimmers, generators, pressure washers and much more. A typical work day for the small engine mechanic may include: diagnostics, repairs, parts sales and orders, inventory management and warranty of private label and major manufactured brands. Northern offers full & part-time positions with opportunities to build a career with a nationally recognized retail team as a small engine mechanic or service representative . Not seeing any openings that match what you are looking for, or want to stay connected with Northern? Join our Talent Network to receive job alerts and relevant company updates and communication. Get notified about new jobs that match you, and let Northern Tool + Equipment know you're interested! Northern Tool + Equipment provides its customers with the tools and supplies to tackle tough problems, but first we have to equip our team with the knowledge and expertise to help those customers. We’re committed to providing our employees with the tools they need to be a highly motivated and expert workforce. We do this through robust learning and development programs and extensive training resources. We don’t “throw you to the wolves” like the other guys. We make sure you learn the job before we leave you on your own. Between your manager, your team and training guides, you can count on them to help you learn the job! Northern Tool + Equipment understands that our leaders come from all different backgrounds. To help deliver appropriate training for our world class leaders, we have developed programs for leaders at all stages in their management. From the newly promoted supervisor to the senior level vice president, there is something to bring your leadership skills to the next level. We recognize that the learning doesn’t end after onboarding. We provide opportunities you can leverage throughout the year to continue enhancing your skills and advancing your career. I really enjoyed my training and everything that was taught is going to help me in my position with Northern! I have worked at other retail stores in my life. Northern Tool does the best job in teaching and appreciating all of us. How will I know if my information has been received? Shortly after completing the application you will receive an email confirmation that we have received your information. Do I have to fill out the application to be considered for a position, or can I mail my resume, email my resume or drop it off in person? In order to be considered for any given role at Northern, you must complete the online application process. Yes, you need to apply for all positions for which you'd like to be considered, even if it is a position you've applied for previously. Log into your account and select the new role for which you would like to apply. Your information will already be in our system, so you don’t need to fill out the application in its entirety again, so it is a quick process. You will receive an email confirmation letting you know that your information was successfully re-submitted. If you have not heard from us after submitting your application, you can assume that we have reviewed your application and felt that we had other candidates whose experience and qualifications were better suited for the opportunity for which you applied. We apologize that we cannot reach out to every candidate to let them know the status of the application. I do not see a job posted where I live, or I am interested in employment with Northern but there are no current openings that match my background. Can I be notified when a job in my location or field of interest comes available? What is Northern’s hiring process? Our recruitment team or Store Manager will review all resumes and/or applications that are submitted for a specific role. We will typically conduct a telephone interview with those candidates that are best suited for the position. If we feel the candidate meets the necessary requirements and core competencies for the role and our culture, the candidate will be referred on for an in-person interview with the Hiring Manager. Depending on the position, you could be invited back for follow-up interviews as well. The application takes about 5-10 minutes to complete. You may exit our online application system at any time, save your answers and return to finish and submit your application when you are ready to do so. What should I do if I am experiencing technical problems with the online application? We apologize if you are experiencing technical problems while using our Careers site. The internet browsers that that are supported by our Applicant Tracking System are Internet Explorer 9-11, Firefox, Chrome and Safari. If after reading this FAQ section, you have not found a solution for the issue, please go to Jobvite Support for additional help. Please describe in detail the problem(s) you are experiencing. I saw a position posted on a job board but it is not posted on your website. Is it still available? Our Careers site has the most up-to-date information regarding openings at Northern Tool. Job boards do not always get updated immediately. If the position is not posted on our website, it is not available any longer. Follow Northern Tool and Equipment's career market on Twitter, Facebook, Linkedin and Glassdoor.